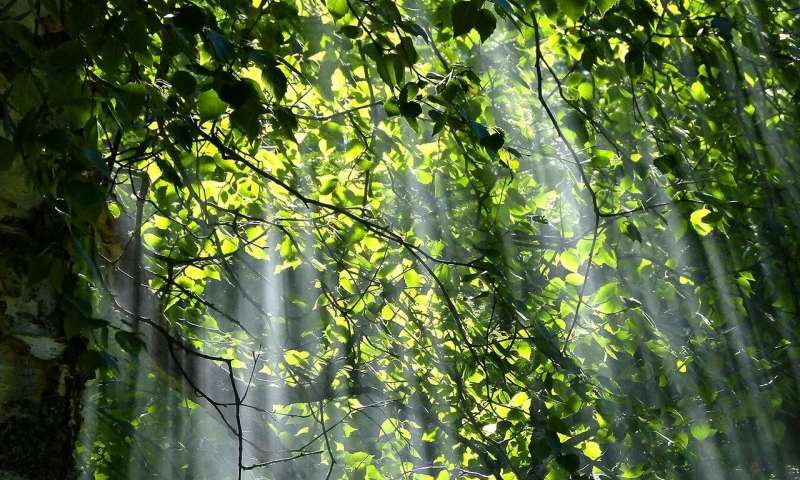 Green plants, algae and some bacteria use sunlight to convert energy. The pigments in chlorophyll absorb electromagnetic radiation, which induces chemical reactions in electrons. These reactions take place in the nucleus of complex protein structures, referred to by experts as photosystems I and II. The processes that take place in these photosystems are induced by catalysts in a certain order. In the first step, oxygen is released from water. A subsequent reaction prepares the production of carbohydrates for which no further source of energy is needed. The reaction centres of the photosystems are encircled by light-absorbing pigments grouped into consolidated complexes. These antennae increase the area available for light rays to hit and extend the spectrum of usable wavelengths, both prerequisites for a favourable energy balance. Each reactor core is surrounded by approximately 30 antennae. Experiments conducted by scientists are still far from replicating this natural complexity. In general, a ratio of 1:1 is the best that can be achieved: one light-absorbing molecule in combination with one catalyst for oxidising water. A group of researchers led by Prof. Dr. Dirk Guldi and his former employee Dr. Konstantin Dirian hope to revolutionise solar technology by synthesising modules based on the correlation between structure and function in photosystem II, and the latest results have been published in Nature Chemistry. In the newly developed systems, light-absorbing crystals, such as those already used in LEDs, transistors and solar cells, are layered into a network of hexagonal honeycombs around a water-oxidising catalyst with four ruthenium metal atoms in the centre. When shown in a simplified manner, these compact, stable units, which are made up of two components with a common long axis, are reminiscent of cylindrical batteries. In the self-assembling chemical process, such 'miniature power stations' create two-dimensional slats. Like layers in a gateau, they form a common block that collects the energy won from the sun's rays. This is not an entirely accurate reproduction of the ideal arrangement found in the natural photosystem, but the principle is the same. Five macromolecules in the shape of a honeycomb with the ability to capture light create a sheath around each reactor core, and it has been shown that these small power stations are efficient and successful at harvesting solar energy. They have an efficiency of over 40 percent, and losses are minimal. Wavelengths from the green portion of the colour spectrum, which plants reflect, can also be used. These research results foster the hope that solar technology can one day make use of the sun's energy as efficiently as nature.